The NJHA, Hereford Youth Foundation of America and National Hereford Women partner to provide scholarships to outstanding NJHA members to assist in their educational endeavors. The Kentucky and Ohio Hereford Associations, along with HYFA, are presenting a scholarship to provide recognition for an outstanding member of the NJHA. Its purpose is to encourage individual cooperative effort, enthusiasm, excellence, leadership, academic success and achievement among youth, and to develop successful individuals as good leaders for both the Hereford breed and the beef industry. This scholarship is made possible by excess funds from the 2006 JNHE held in Louisville, Ky., and hosted by the Ohio and Kentucky Hereford Associations. Applicant must be a NJHA member in good standing. Applicant must be a paid member for the past three consecutive years. Applicants must be between the ages of 17-24 years of age and must have completed their junior year of high school and/ or currently enrolled in a two or four year accredited university, junior/ community college and/ or a technical institution, pursuing a degree in an agriculture related field. All applicants must have maintained at least a “C” or 2 .0 grade point average. A current academic transcript must accompany the application. Applicants meeting the necessary requirements can apply any number of times provided they maintain the required academic standards. A new application must be submitted each year, and the same applicant may only receive the scholarship no more than two times. Applicant must be nominated by their state junior association advisor with a letter of recommendation submitted to hereford.fluidreview.com by April 1. Applicant must submit a second letter of recommendation from someone of their choosing and it must be submitted to hereford.fluidreview.com by April 1. Submit online application to hereford.fluidreview.com by April 1. Upload high school or college transcripts, whichever is applicable. Submit two “current” letters of recommendation, one from a state advisor and another from someone of your choosing. Upload a high-resolution photo, 300 dpi or higher. Submit a 500 word essay outlining the need and impact this scholarship will have upon your decision to pursue and complete your degree. A selection committee will evaluate the application. No interviews will be held. Recipients will be recognized at the JNHE during the awards ceremony. Charles E. Boyd Sr. was a third generation Hereford breeder that mentored youth in the agriculture industry. Throughout his lifetime, he was recognized on local, state, and national levels for his accomplishments. He was a prominent beef cattle judge at all major livestock shows and exhibited several International and National Champion Hereford cattle. Determination, hard work and honesty were qualities he not only passed down to his family, but to those he helped along the way. He was never too busy to share his knowledge in the areas of feeding and breeding high-quality Polled Herefords. Selflessly giving to others without recognition is how he lived his life. His service to the agriculture industry has influenced young people and their families for many years. The Charles E. Boyd Sr. Scholarship will continue to help young people in the Hereford breed who plan to go to college and pursue a degree in agriculture. Applicant must be a NJHA member in good standing. Applicant must be a paid member for the past three consecutive years. All scholarship applicants must be a high school senior or enrolled in a four- year accredited university, junior/ community college and/ or a technical institution. All applicants must have maintained at least a “C” or 2 .0 grade point average. A current academic transcript must accompany the application. Applicants meeting the necessary requirements can apply any number of times provided they maintain the required academic standards. A new application must be submitted each year. Incomplete applications will not be accepted and we advise a family member, teacher or advisor review your application prior to submission. Golden Bull junior achievement awards are presented each year. A bronze Hereford bull model from the American Hereford Association and the National Junior Hereford Association and cash stipend from the Hereford Youth Foundation of America and National Hereford Women will be awarded to four junior members. Applicant must be an active member of the National Junior Hereford Association and 18 years of age as of Jan. 1. Applicant may receive award only once. NJHA directors are ineligible to receive an award. Parent or guardian of applicant must be a current paid member of the National Hereford Women or the American Hereford Association. A three-member selection committee from the National Hereford Women will be appointed to independently review the applications, which will be evaluated on a combined point system. Application must be filled out electronically through hereford.fluidreview.com by April 1st. Attach a photo for publication, official high school and college transcripts and a maximum of two letters of recommendation. Interviews will be conducted at the Junior National Hereford Expo. Finalists will be notified of the interviews prior to the interview process. Attach an essay that describes how your Junior Hereford Association activities have benefitted you and how they will help your future in the beef industry. Scholarships will be awarded to two deserving members of the National Junior Hereford Association to continue financing their education. This scholarship will be funded through the Hereford Youth Foundation of America through funds designated to the Hereford Herdsman Fund that is supported by Hereford Herdsman and Sullivan Supply. Scholarship amounts will be based on funds available through the Herdsman Scholarship Fund on a yearly basis. Applicant must be a member of the National Junior Hereford Association and be between the ages of 17-21 years of age as of January 1 in the year of application. Applicant must have attained the status of a high school senior and enrolled in an accredited university or college level program. Previous winners are not eligible to receive the award for a second time. Immediate family must have been involved in the Hereford breed for at least five years. Application must be filled out electronically through hereford.fluidreview.com by April 1st. Attach your high school or college transcripts, whichever is applicable, and acceptance letter into college if just entering or transferring into a four-year university. A selection committee will evaluate the application. The top five finalists will be notified two weeks following the application deadline. An interview time will be established with the top five ranked applications during the Junior National Hereford Expo. A panel of three judges will rank the final applicants. NO phone or online interviews will be conducted. Interviewees must be present. Scholarship will be awarded at the Junior National Hereford Expo each year. 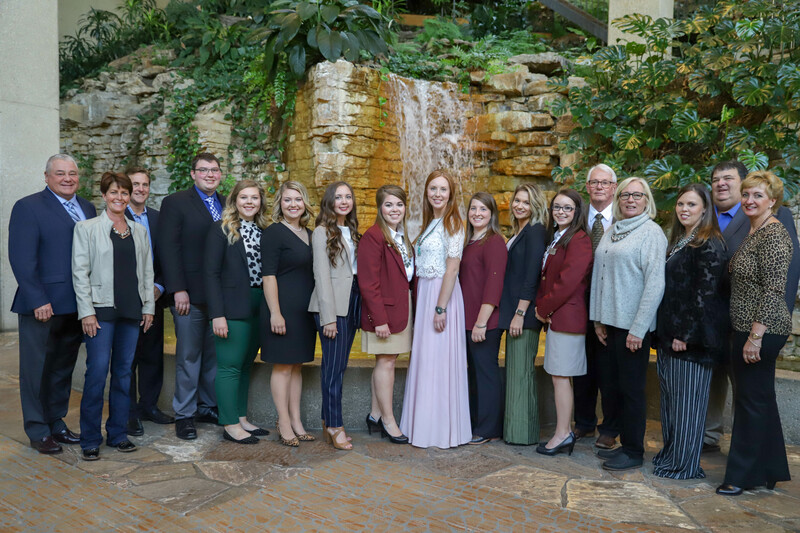 The Hereford Youth Foundation of America and National Hereford Women will annually award two college scholarships to individuals having made outstanding contributions to agriculture and the Hereford industry. Two winners will be announced at the Junior National Hereford Expo. Applicant must be an active NJHA member. Applicant may receive award only once. Parent of guardian of applicant must be a current paid member of the National Hereford Women or the American Hereford Association. Applicant must be enrolled on a full time basis in a college of their choice at the time the award is received. Applicant must be interested in pursuing a career related to agriculture, home economics or a field directly related to the Hereford industry. A qualified selection committee designated by the NHW executive committee will review applications. Attach a photo for publication purposes, official high school and college transcripts and a maximum of two letters of recommendation. The National Junior Merit Scholarship program is designed to provide recognition for outstanding members of the National Junior Hereford Association (NJHA). Its purpose is to encourage individual and cooperative effort, enthusiasm, excellence, leadership, and achievement among youth and to develop good breeders for both Herefords and the beef industry. These scholarships are awarded to further higher education opportunities for NJHA members. The NJHA appreciates the value of a college or technical education and urges juniors to take advantage of every educational opportunity. Each year up to three college scholarships are provided by the Hereford Youth Foundation of America. First place is awarded a monetary scholarship, plus a subsidized trip to a Hereford operation in the continental U.S. provided by American Livestock Inc. Second place and third place are awarded monetary scholarships. Applicant must be a member of the National Junior Hereford Association and be under 22 years of age as of January 1 in the year of application. This award program is designed for older junior members who will soon enter college or are already attending college. Applicants can apply any number of times provided they are not previous first place winners. At least one semester of college must have been completed with at least a “C” or 2.0 grade point average maintained prior to any funds being awarded. Schools that qualify for attendance are a four- year university, a two- year community college or a technical school program. Include a transcript with the application. Applications are provided to the National Junior Merit Award selection committee for their designation of applicants who will compete for the three scholarship awards. Honoring the women who laid the foundation for the National Organization of Poll- ette’s. The NOP was organized in 1965 and at that time it was known as National Council of Poll- ette’s. Applicant must be a NJHA member. Applicant must be between 17-22 years of age by Jan. 1 of the current year and attained the status of a high school senior, but not yet completed his or her senior year in college. Interviews will be conducted at the Junior National Hereford Expo. Finalists will be notified of the interviews prior to the interview process. NO phone or online interviews will be conducted. Interviewees must be present. Electronically submit copies of high school or college transcripts, whichever is applicable. Also submit acceptance letter into college if just entering or transferring into a four-year university. The Bud B.C. Snidow Award, sponsored by the National Hereford Women, will be given at the JNHE to a deserving NJHA member who exemplifies the qualities most admired in Bud B.C. Snidow. Some of these qualities are honesty, fairness, hard work, enthusiasm and dedication to the Hereford breed and its people.. In an effort to properly select the most deserving junior member, advisors of each state junior association are asked to officially nominate one junior member from their state for this award. A letter of recommendation from the state advisor(s) must be uploaded through hereford.fluidreview.com. The letter should include the nominee’s background and evidence that he/she is worthy of the award. Application must be filled out at hereford.myreviewroom.com. Nominee’s address, phone number, age on Sept. 1 of the current year and parent’s names must be included. A high-resolution photo of 300 dpi or higher must be uploaded to the Hereford Review Room. Current NJHA officers or directors are not eligible to be nominated. All nominations must be uploaded to hereford.myreviewroom.com by April 1. Gary Bishop, an Oklahoma native, first began working for the American Hereford Association in 1973 serving in the capacities of assistant director of Total Performance Records, director of feedlot and carcass programs and director of field services. He also served as director of youth activities, a job that he held in high esteem throughout his life, as he dedicated much of his energy working for the betterment of the Hereford youth organization. Bishop left the AHA in 1983 to manage the family’s large purebred and commercial Hereford ranching operation in Montana. He was actively engaged in community organizations, particularly his church and the 4-H program. Alway sinnovative and in pursuit of a new challenge, he helped many youths step out of their comfort zone to reach new heights. He rejoined AHA in 2000 as director of breed improvement. Gary passed away Dec. 17, 2002, after fighting a battle with cancer that he met with strength and determination. His many friends called him hard working, dedicated, faithful, determined, a perfectionist and a true gentleman who came to work each day until the end with a gentle smile on his face and ready to face the challenges of the day; a man of principle, whose character was complemented by his capability; that he was a friend to all who knew him and always had kind words to say- even when the going got tough. This scholarship is designed to recognize those youth who demonstrate many of the same qualities that Gary demonstrated. A $2,500 scholarship will be awarded to a deserving member of the NJHA to continue financing their college education. This scholarship will be funded through the Hereford Youth Foundation of America. Applicants must be between the ages of 17-22 years of age and/or have attained the status of a high school senior. Submit application online through hereford.fluidreview.com by Sept. 1. Submit high school or college transcripts, whichever is applicable. Also submit acceptance letter into college if just entering or transferring into a four-year university. The scholarship will be awarded in Kansas City, Mo., during the AHA Annual Meeting. The Hereford Youth Foundation of America scholarship program is designed to provide recognition for outstanding members of the National Junior Hereford Association. Its purpose is to encourage individual and cooperative effort, enthusiasm, excellence, leadership, academic success and achievement among youth and to develop successful individuals as good leaders for both the Hereford breed and the beef industry. One $5,000 Ball Foundation/ Cottonwood Springs Farm Scholarship 9. All scholarship applicants must be enrolled in a four- year accredited university, junior/ community college and/ or a technical institution. Submit online application through hereford.fluidreview.com by Sept. 1. Submit high school or college transcripts, whichever is applicable. Also submit acceptance letter into college if just entering or transferring into a four- year university. Submit two “current” letters of recommendation. After applications are received and reviewed the top applicants will be notified and Zoom online interviews will be conducted to finalize the selection process. Winners will be notified following the application deadline. Scholarship will be awarded in Kansas City, Mo., during the AHA Annual Meeting. It is strongly recommended that you be in attendance to accept your scholarship award. Deadline is Sept. 1. Apply online at www.hereford.fluidreview.com.